The bar chart below gives information about the number of students studying Computer Science at a UK university between 2010 and 2012. The bar chart illustrates the number of male and female students studying Computer Science at a UK university over three years. It also indicates whether they were home or international students. Compared to the number of home students, the number of international students was significantly smaller. Nevertheless, there was clear statistical growth in the latter group from 2010-2012. Furthermore, the number of female home students eventually overtook the number of males from the same group, reaching a high of 45 in 2012. The year 2011 saw the most dramatic developments; the number of male home students fell from just below 40 to 24 and the number of females rose from 32 to 44. 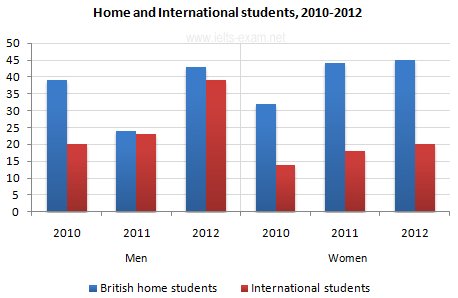 There was also significant growth in the number of male students from overseas, climbing from 20 in 2010 to 39 in 2012. Overall, we can see an upward trend in the number of students at the university.